The television show has been off the air for almost 10 years, but Kristina Carrera still remembers how important the teen drama was to her. It was the rare moment when Carrera, 27, saw herself reflected in movies and television shows. South of Nowhere, a show about a young woman who was struggling with her sexual orientation, was one of those times. For Carrera, a Puerto Rican woman who identifies as a lesbian, it was a powerful moment of being seen. "It brought me comfort," said Carrera, who lives in Downingtown. "It made me feel a little less alone." So when Carrera came across marketer and philanthropist Frederick Joseph's Black Panther Challenge, a fund-raising campaign that he began to help black kids in Harlem see Marvel's forthcoming Black Panther movie, Carrera was all in. She knew, as my colleague Brandon T. Harden so powerfully captured in his recent essay, how representation can be revolutionary. In no time, and with the help of big names like Ellen — yeah, that Ellen — Joseph's fund-raiser raised more than $40,000. The TV host pledged to cover the full $10,000 for the children of the Boys and Girls Club of Harlem, and their chaperones, to see the movie. The donations will now be used to fund other programs for Harlem kids. It was a "happy ending" that wasn't an ending at all. Joseph called on others to launch similar GoFundMe campaigns for kids in their communities. According to GoFundMe, more than 400 campaigns have raised upward of $400,000, making it possible for thousands of kids to see the movie this month. Donations have come in from all 50 states and 40 countries around the world. Carrera is one of several who answered the call locally, setting up a GoFundMe page for Philadelphia students. When she isn't working at the Apple store in the King of Prussia mall, she's sharing her fund-raising campaign on social media and targeting some of our better-known Philadelphians, hoping they'll do for Philly kids what Ellen helped do for kids in Harlem. @JOEL9ONE show these kids one more time that heroes exist more than just on the big screen! That would be cool. But I also love the idea of a whole community or city stepping up for their own, which is how my fellow columnist Jeneé Osterheldt's tweet caught my attention. "I just sent 5 kids. You can do the same. 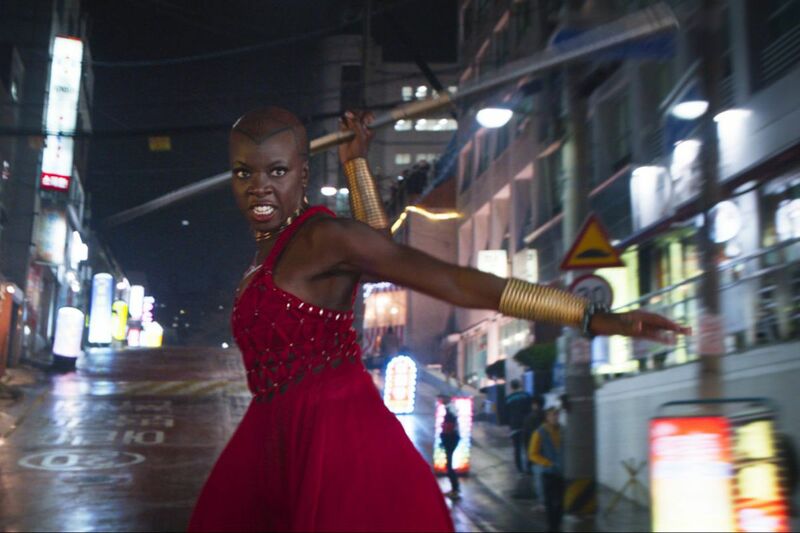 Skip your brunch and send the babies to Black Panther," tweeted the Kansas City Star culture columnist. Columnists of color know how important representation is, how transformative it is to not only have such a privileged platform but to use it to share and amplify stories and voices not always valued in newspapers. So, I'm following Osterheldt's lead and skipping brunch (if I ever actually brunched) and donating to Carrera's GoFundMe. It's about 11 bucks per student for a ticket and a snack pack. I'm sending five students, because if young black and brown Philly students can look up at the big screen and see such fantastic possibilities, surely they can open their local paper and envision becoming reporters and columnists and editors who will one day end up running the joint. With the donations already made to Carrera's campaign, a couple of dozen students from LINC High School are headed to the movie later this month. She's working with principal Rauchaun Dupree at Comegys School to get many of her students there, too. The other night DuPree and Carrera talked for hours, plotting ways to spread the word and get as many students as possible into theaters — transportation is one of the biggest challenges. "I saw her tweet and I knew I wanted my kids to be part of this," DuPree said. "This is exactly what they should be exposed to. I tell them all the time that they are heroes, that they are kings and queens — this movie can only help bring that message home." So, you in? Skip brunch and send a Philly kid to Black Panther.